This is a striped barked scorpion, very common to Texas. 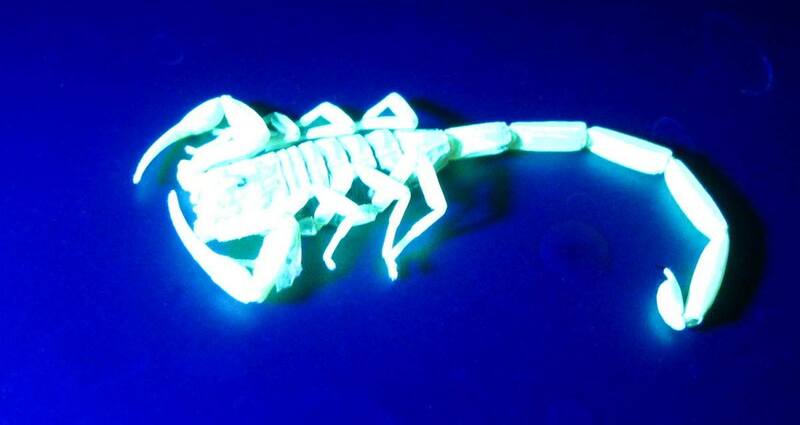 All scorpions illuminate this way under a black light. No one is sure if this trait serves any purpose for the scorpion but it is pretty cool! This entry was posted in Scorpions, Uncategorized and tagged alien, black light, glowing scorpion. Bookmark the permalink. 2 Responses to It glows like an Alien… but it’s not! I just wrote about glowing Scorpions! Sorry… I am new to this and pushed the reblog button by accident.. when I was trying to comment to yours. Sorry! As soon as I saw what I did… I deleted the reblog from my blog. I enjoyed your blog very much on Scorpions! !